Firstly I would like to apologise for the poor quality of photo its now the time of dark nights and dark mornings here in Scotland so that means really poor light for taking photos...and this is even being enhanced with picasa! I inked it and lightly pressed it to the paper in a dark brown like the cupcake tree and then used the other colours to make the light in the window and the green trees. I added some liquid pearls to make the falling snow, on the lightly chalked the background. The sentiment is the one that came with the image . A lovely Christmas card Jenni. Such a nice wintery scene! 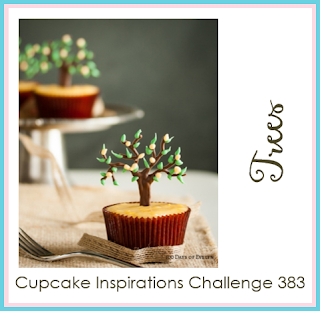 So glad you were inspired by this week's Trees Challenge at Cupcake Inspirations! Beautiful holiday scene...love your sweet card. What a beautiful scene! Thank you so much for joining us at Cupcake Inspirations!